Spring Is Here! Join Broadway Stages at Our Rooftop Farm! Broadway Stages is proud to play its part in keeping Brooklyn green. Eagle Street Rooftop Farm is a 6,000-square-foot green roof organic vegetable farm located atop one of our warehouses in Greenpoint, Brooklyn. On the shoreline of the East River and with a sweeping view of the Manhattan skyline, our rooftop farm is the perfect place to enjoy a beautiful spring day. Please visit rooftopfarms.org for more information. Broadway Stages President Gina Argento wants you to make a difference by donating old clothing to those who need it. Clothing drives are a great opportunity to share your unwanted clothes with others instead of throwing them away. Not only do clothing drives help people in need, but they are environmentally friendly, as unwanted items are donated rather than thrown away. As a financial contributor to the Ujima Community Working Together's (UCWT) dress drive, Gina provided recipients with new clothing to wear to the prom. Gina encourages everyone to donate and contribute new or used clothing to clothing drives instead of throwing items away. Broadway Stages President Gina Argento wants to inspire Greenpoint and Williamsburg residents to go green. Partnering with Town Square, a local volunteer-based community, Gina aims to educate residents and spread the benefits of environmental stewardship. As part of her effort to advance green education, Gina is a proud sponsor of Town Square's Go Green! Brooklyn Festival and its mission to teach Brooklynites the benefits of local sustainability. Gina hopes that her dedication to the environment inspires others to join her and Broadway Stages in promoting sustainability. Broadway Stages is Brooklyn's largest solar-powered full-service soundstage production company. Broadway Stages also participates in NYC's CoolRoofs initiative to reduce carbon emission and reduce energy consumption. Broadway Stages and Gina want to continue our environmental stewardship for a greener future for us all! Gina Argento, President of Broadway Stages, encourages everyone to take part in keeping Brooklyn clean. Gina is working in collaboration with the organization Ujima Community Working Together (UCWT) to remove graffiti from local community buildings. UCWT's graffiti removal initiative is an important part of cleaning unwanted and illegal vandalism on Bushwick resident buildings and businesses. The initiative partners local students and volunteers, including the 83rd Precinct, to team up and remove graffiti together. As a financial contributor, Gina seeks to aid UCWT and the Bushwick community in this initiative. 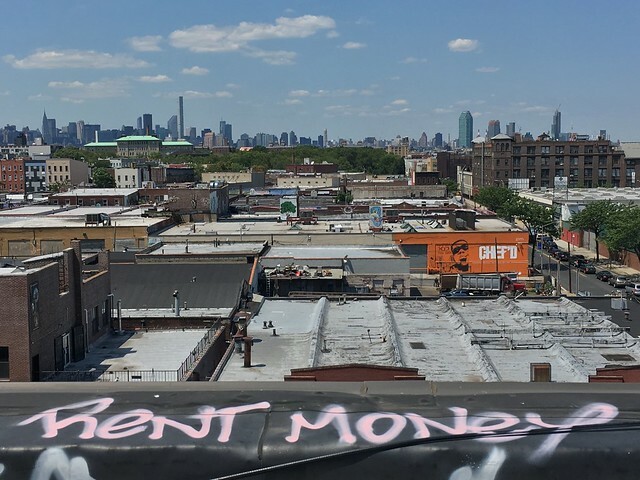 Join Gina in her efforts to combat graffiti in Brooklyn and Bushwick! Gina Argento, President and CEO of Broadway Stages, is an avid supporter of the preservation of wildlife in New York City. Determined to protect New York City's wildlife, Gina financially contributes to the New York City Audubon, a collection of community members dedicated to the protection of bird species and nature. She is also contributing to its Fall Roost, an annual benefit that raises money to support conservative efforts. Gina's contributions will be used to fund educational programs that teach New Yorkers about the importance of wildlife conservation and offer them opportunities to help. Her participation in the New York City Audubon Fall Roost also celebrates the $150,000 raised to expand conversation efforts in Governor's Island as part of the Governor's Island initiative. Join the initiative to help bird species and wildlife in New York stay healthy and continue to grow! Go green for the future! 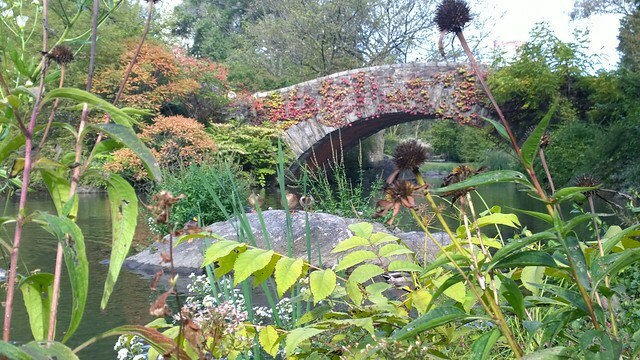 Gina Argento, President and CEO of Broadway Stages, Brooklyn's largest film and television production company, is excited to complete the next phase of the Kingsland Wildflower Project with our partners at the New York City Audubon and Alive Structures. The Kingsland Wildflower Project is a green initiative project to attract wildlife and support green educational programs year-round through construction of rooftop gardens. Having already contributed 10,000 square feet in rooftop space for the Kingsland Wildflower Project, Broadway Stages' Gina Argento will continue to contribute areas for the project. Her contributions will include the installation of waterproofing materials to prevent water damage and assessments of the structural integrity to safely sustain the garden's weight. Gina will also provide financial donations required to install the green roof onto one of Broadway Stages' warehouses. The Kingsland Wildflower Project is part of Broadway Stages commitment to create a greener future. Congresswoman Carolyn B. Maloney publicly recognized Gina Argento's commitment to giving back to the Greenpoint community. Gina is a leader in New York City's sustainable movement. She has helped transform the city into a strong and environmentally responsible community by contributing to green initiatives and funding green education opportunities. Under Gina's leadership, Broadway Stages has become a leading green establishment committed to solar energy, rooftop farms, and NYC's Cool Roofs program. 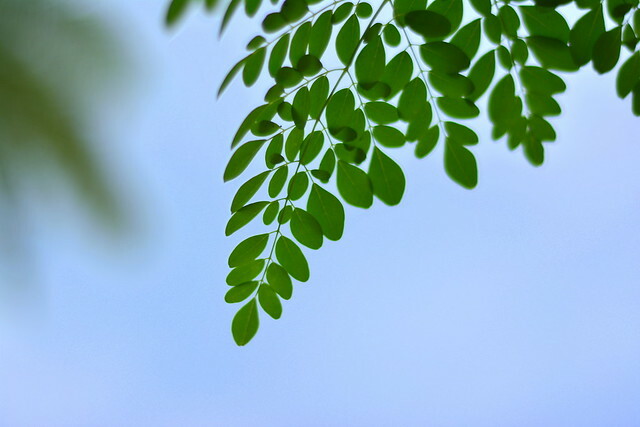 Gina has raised awareness of environmental consciousness by sponsoring green education programs including Green Science Week at PS 110 and the STEM lab at Kingsborough Community College. These programs educate students with green initiatives and demonstrate how they can contribute to building a greener city. Gina's support for the community also extends to communal development programs for youths and families. She is involved with the YMCA and the Boys Scouts of America, which promote youth development. Congresswoman Maloney acknowledged Gina's commitment towards the Greenpoint community, describing her as "a successful businesswoman, environmentalist, and fantastic neighbor." Broadway Stages welcomed the Williamsburg High School of Architecture and Design's 12th grade environmental science class as they visited our solar rooftop. Thank you to David Buckner of Solar Energy for stopping by to speak and Sarah Tom of Williamsburg High School for having such wonderful students. Kingsland Wildflowers at Broadway Stages Grand Opening! 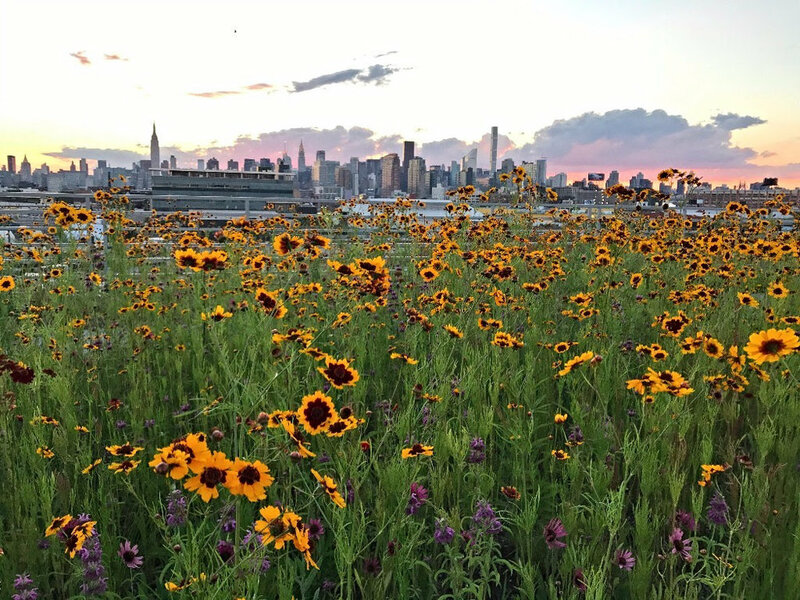 Kingsland Wildflowers, built on a rooftop here at Broadway Stages, is a Greenpoint community project committed to expanding natural habitat and green corridors native to the New York City landscape. The vision, conceived through partnerships between local businesses, community voices, and wildlife experts, will provide Greenpoint with living and growing infrastructure to support native New York City wildlife and educational programming focused on sustainable conservation practices and wildlife protection. Learn more at kingslandwildflowers.com. We are so proud to support this initiative and look forward to hosting events that bring members of the community together for a fantastic cause. With the help of Cheryl Blaylock, Director of Youth Programs at Trees New York, Broadway Stages staff had a chance to work hand-in-hand with the organization's new interns for a day. We cleaned up garbage, re-mulched, and watered dozens of trees around Kingsland Avenue in Greenpoint. Thank you to everyone who participated! Please visit www.treesny.org for more information on how to get involved.